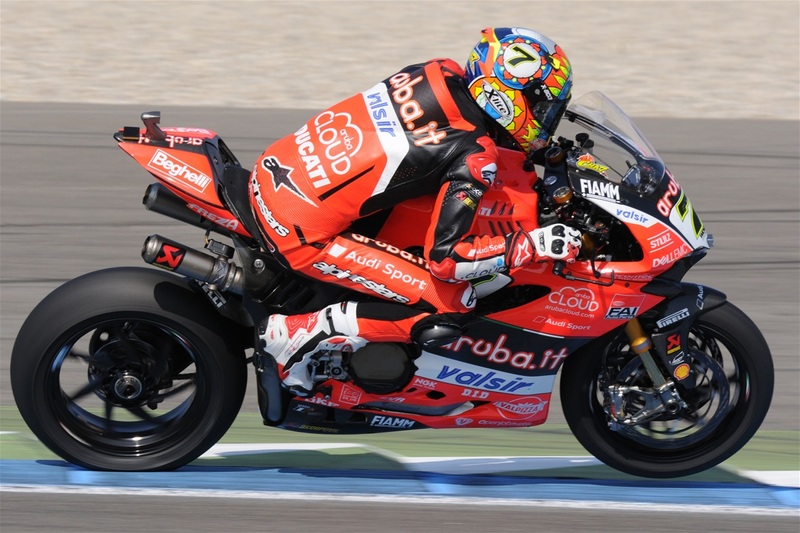 Race 1 of the sixth round of the 2018 WorldSBK Championship, held at Donington (United Kingdom), turned out to be more difficult than expected for the Aruba.it Racing - Ducati team. Chaz Davies and Marco Melandri fought gallantly but struggled since a difficult Superpole, finished in third and fourth row respectively, which didn't allow them to mount an attack to the podium. The Welshman and the Italian actually rode most of the race together, until six laps to go: Melandri then crashed out without consequences at turn 12, then he climbed back on his bike to finish 22nd, while Davies managed to recover two positions during a thrilling last lap to take home eighth place. Michael Ruben Rinaldi, with the Aruba.it Racing - Junior Team, recovered three positions from his starting place on the grid to finish 12th. The Aruba.it Racing - Ducati team and the Aruba.it Racing - Junior Team will resume action Sunday, May 27th, at 09:45 local time (CET -1) for a warm-up session ahead of Race 2, which is scheduled to start at 13:00 local time. "I entered the race with good confidence despite the grid position, I thought we could have a shot at the podium but unfortunately it's been a difficult one. We struggled to get the feeling that I wanted, obviously the crash yesterday didn't help as it reduced our time on track, but I expected to make bigger steps forward today. We didn't have much grip so it was a case of just getting the best out of it, which today meant riding as smoothly as possible. Things change pretty quickly in this game, so hopefully we'll be able to turn things around ahead of tomorrow." "We've been working hard as ever but we're still trying to understand why we struggle on this track. It's been a difficult weekend so far, in the wet and in the dry. As for the crash, I've been riding with Chaz pretty much all race until then and I knew I was faster in the first two splits and he was faster in the last one, so it was very difficult for me to pass him and I was just trying to stay closer to him but unfortunately I lost the front. With the new rules, we've been struggling for a while under some aspects, such as getting the bike to stop and turn as it used to. We need to try and improve, one area at a time. Tomorrow's another day." "We tried to work at the best of our capabilities, limiting the damages on a track that doesn't suit us particularly, and I think we rode a solid race despite the fact that our potential is higher. I'm happy with the way we worked with the whole crew, and tomorrow we'll try to make other steps forward and be ready for whatever the weather brings." "Despite the fact that Chaz and Marco fought as hard as ever, today's race has been more difficult than expected. We need to analyze the data in great detail to bounce back as soon as possible. We don't lack motivation and the riders' talent is not under discussion. Tomorrow the weather could play a key role, so we need to be ready."